With increasingly high number of megapixels in digital camera, the size of photos and images keeps increasing too, thus making sending photos via email involves trouble of resizing or making the photos smaller in size and resolution, or risk slow transfer speed or failed delivery due to over email size limit. To make life simpler, Windows XP and Windows Vista has built-in feature that automatically resize the photos and images to make them smaller for use in email. To use the easy feature, launch Windows Explorer or My Computer or My Documents, and then navigate to the folder that containing the pictures you want to send by email. Locate your photos or pictures, and right click on the picture or photo you want to send then choose “Send To” and then choose “Mail Recipient”. You will then presented with 2 options of either “Make my pictures smaller” or “Keep original sizes”. 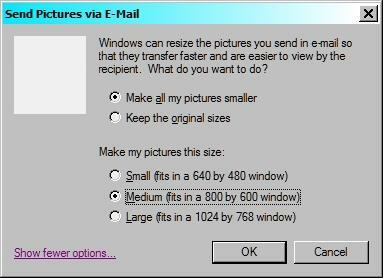 So if you want to reduce the size of pictures to send in email, just select “Make my pictures smaller” selected by default. It’s possible to customize the size and resolution setting of the pictures by clicking “More Options”. The default settings is good enough and will send the picture more or less as is, with little or no reduction in picture quality but at a greatly reduced file size. When done, click OK and your default email client (such as Microsoft Outlook or Outlook Express) will be launched and New Message Window will automatically opens, with your picture file attached. All you have to do now is to write your message, fill in your friends or recipients’ emails in address box and click Send to send the email with attached photos.